School of Rock All-Stars top Grand Opening Celebration With Free Q104.3 All-Ages Show - Feb. 24 in Wantagh, New York. Long Island has been doubly given "the gift of rock" with the recent arrival of the nationally renown PAUL GREEN SCHOOL OF ROCK MUSIC to new locations in Nassau and Suffolk Counties. Fast becoming famously hip amid rapid national expansion as the place to teach kids how to rock - from the classroom to authentic concert stages - the Paul Green School of Rock continues its ongoing mission of "saving rock 'n' roll one kid at a time" with Long Island branch openings in Port Washington (Nassau County) and Melville (Suffolk County). Classes are just beginning at the Port Washington and Melville branches of PAUL GREEN SCHOOL OF ROCK, but the nationally renown SCHOOL OF ROCK ALL-STARS will make the Long Island arrival official with a free, all-ages concert, hosted by Bob Buchmann and Q104.3, Saturday, Feb. 24 @ Mulcahy's, 3232 Railroad Ave, Wantaugh, NY 11793. For club information, call (516) 826-MULS. The SCHOOL OF ROCK ALL-STARS is a group of veteran and newly rising all-star students (ages 7-17) from Paul Green School of Rock branches nationwide. The group plays many of the top festivals and concert venues in the country, consistently bringing "the gift of rock" to capacity crowds of all ages with the greatest classic rock hits from Zeppelin to Zappa. The All-Stars concert caps what should be a bustling afternoon of Open Houses at the Port Washington and Melville branches of the PAUL GREEN SCHOOL OF ROCK from noon to 5 p.m.
Classic rock rules at all 30 branches of the PAUL GREEN SCHOOL OF ROCK that have sprouted across the country. Students at every school are learning to play some of the most intricate classic rock with a keen focus on performing the music before live audiences in actual concert venues. Preparations already are under way for the first live show at each school, Pink Floyd's "The Wall," planned for late spring. In fact, the Long Island branches already are proving so popular with new enrollees that a second show at each location is expected to be added with an entirely different theme and cast of students. The students will be staging live shows every three months, and in keeping with Paul Green's philosophy, who better to teach than real musicians with years of live concert experience! THE PAUL GREEN SCHOOL OF ROCK PORT WASHINGTON is located at 275 Main St. Hours are Monday and Wednesday from 2:45 to 8 p.m. and Saturday from noon to 6 p.m. THE PAUL GREEN SCHOOL OF ROCK MELVILLE is located at 1144 Walt Whitman Road. Hours are Tuesday and Thursday from 2:45 to 8 p.m. and Saturday from noon to 6 p.m. For further information on both Long Island branches, call (516) 767-2262. The Port Washington and Melville branches also are offering a special two-week Summer Boot Camp that can be the perfect compliment to their core program or a wonderful first time introduction to the school. Sessions will be held in July and August. Summer Boot Camp is an ideal program for students seeking to be immersed in the summer day camp experience in a hands-on atmosphere studying fundamentals and technique, while working with other students via ensemble rehearsals. The two-week program culminates in a mini-rock concert in front of family and friends.
) has expanded to more 30 branches including New York, Los Angeles, Chicago, San Francisco, Portland, Salt Lake City, Austin and St. Paul, with plans to further expand to 50 schools by the end of 2007. Article courtesy of Randex Communications a full service music, entertainment and lifestyle public relations company that represents all genres of music. For all media inquiries or more information contact Randy Alexander, Randex Communications (856) 596-1410. 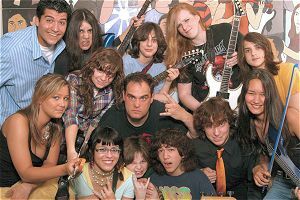 Subject: LongIsland.com - Your Name sent you Article details of "School of Rock Comes to Long Island, New York"